The Vietnamese ministry of transport has approved a plan to build a high-speed railway between Saigon and the southern port city Can Tho. It is expected to take 45 minutes instead of 4 hours. The 139-kilometer railway will pass through five cities and provinces including Ho Chi Minh City, Long An, Tien Giang, Vinh Long, and finally Can Tho and is planned to start at the end of 2018. A train line connecting Sa Pa town and the Mount Fansipan cable car station will be put into operation on March 31, 2018. The 2-km-long route with two tunnels and four viaducts will serve 2,000 passengers per hour. It will help tourists reduce travel to only 4 minutes from 20 minutes by car along a rugged mountain road. Considered the third property of Hilton Group in Myanmar after Napyitaw and Ngapali, Hilton offers a luxury service in the second biggest town of the country, Mandalay. There are 231 rooms and many of them have private balconies with views of the Mandalay Palace and the pagoda-dappled Mandalay Hill. 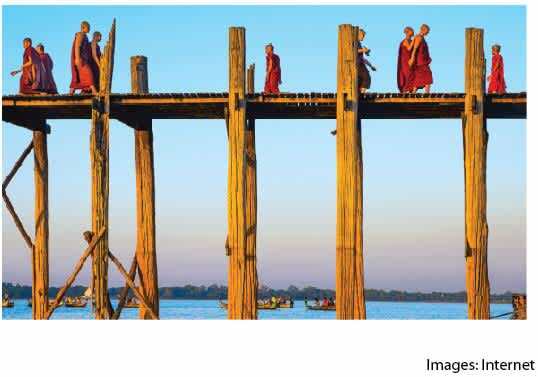 Myanmar has introduced a fast-track tourist visa that delivers confirmation within 24 hours of the application, year-round, including public holidays starting in April this year. All nationalities are eligible for an e-tourist visa which costs USD 56. Rosewood has opened its first resort in a hilltop forest near Luang Prabang. The resort has 23 guestrooms, including six luxury tent villas, each of which is located on a secluded hillside. The design follows the concept of an early 1900s “hill station” where French hosts would welcome travelers. The pool, tucked between a forest and a natural waterfall, is another highlight of the resort. Minor Hotels Group has also launched its new upscale brand extension, Avani+ also in Luang Prabang, close to the Mekong River. 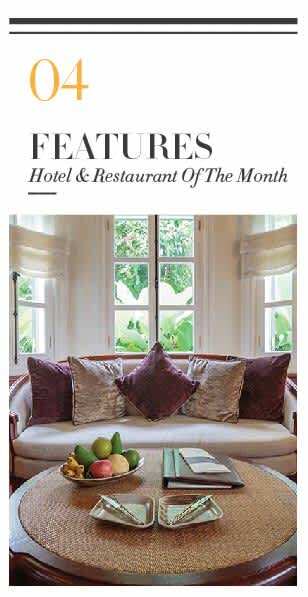 It features 53 French colonial-inspired rooms with either balcony or a terrace overlooking either the pool or a private courtyard. Located in a tropical garden in Luang Prabang, Ock Pop Tok serves as a resource centre focused on Lao textiles, crafts and culture. As well as marvelling at the wonderful textiles themselves you can attend fun and interesting classes, workshops and seminars that are great for kids andadults alike. 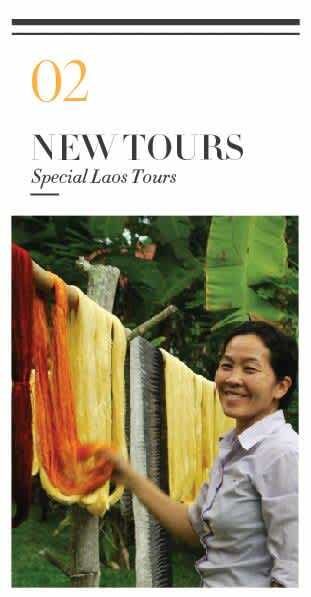 The Silkworms and Natural Dyes class is an excellent introduction to Lao textiles where you can get to try a bit of everything, even dying your own scarf. During the class, there’s a discussion panel where you can raise questions to the artisans about the techniques, cultural background, in fact anything related to the beautiful weaving art of the Lao people. At Ock Pop Tok you can “Create – Shop – Eat – Stay – Learn” in just one place. At the end of the day enjoy sunset cocktails beside the magnificent and tranquil beauty of the Mekong River. All you need to do is relax in an exceptionally beautiful, peaceful and creative setting, away from the bustling tourist centre of town. Veiled by flowering vines and tropical foliage, the Villa is perched right on the banks of the Mekong River, with unobstructed views of the river and the surrounding mountains. Biking is not only a healthy, affordable and sustainable way to get around, but presents great opportunities to know their environment. A holiday in Luang Prabang, Laos offers the chance to cycle through lovely villages, lush vegetation and waterfalls, as well as visit an Elephant Camp. 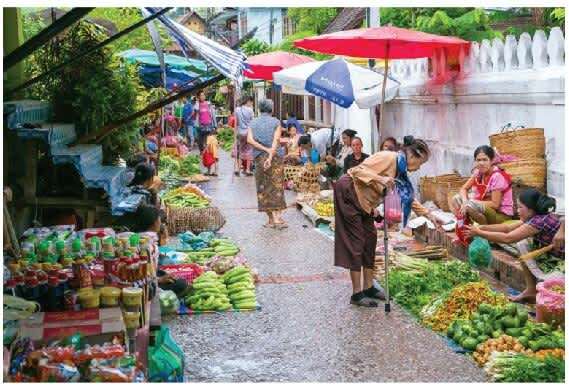 In addition, you can take a boat to Nong Khiaw – a picturesque town surrounded by towering limestone karst formations and take part in a cooking class where you can learn to make some delicious Lao specialties. Besides offering great activities for both leisure and adventurous travellers alike, Luang Prabang is also a friendly destination for families. Kids can gain a huge amount of confidence through learning new skills, meeting new people, having fun with animals and exploring a new country in a positive way. Landlocked and to some extent ‘culture-locked’, Laos possesses both Southeast Asia’s most pristine environment and possibly its most culturally intact heritage. 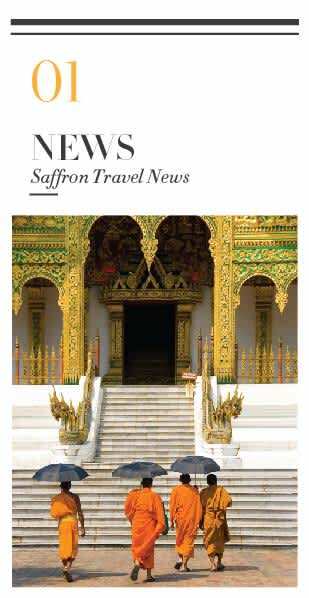 In this newsletter, Saffron Travel introduces some of our favourite destinations to visit and experience. It might not be one of the first destinations that springs to mind when planning a honeymoon, but overlook Laos and you’ll be missing out on one of the most exciting countries to travel to right now. Isolated from visitors until recently, it offers a truly authentic slice of South-East Asia. An unspoiled land of mountains, valleys and jungles, where many villagers go about their life much as they have done for centuries. 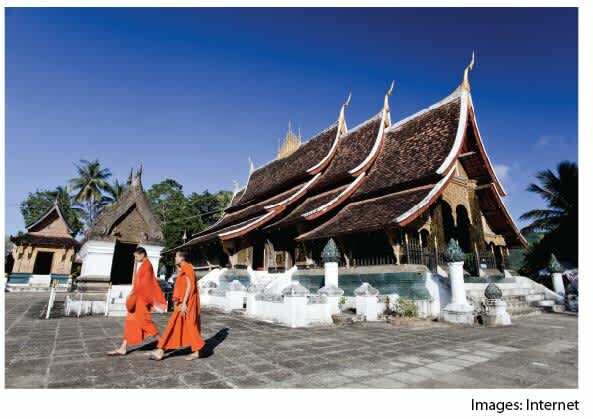 Orange-robed monks line up to receive alms and tranquillity rules – the perfect antidote to hectic wedding preparations! If you’re looking for an adventure on a road less travelled, in a land that is the very definition of laid-back, Laos might just be the honeymoon destination for you. The Dong Hua Sao mountain range is one of the 20 Nationally Protected Areas in Laos. Its area spans over 1100 sqkm. 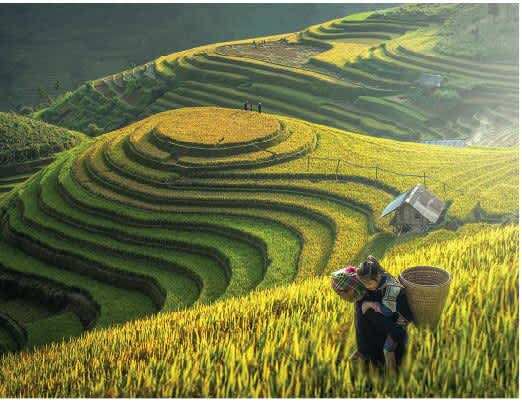 Half of it is mountainous with steep to very steep slopes rising to the edge of the Bolaven Plateau at an elevation of up to 1000m, with peaks near the plateau rim of up to 1300m. At the highest points sub-zero temperatures can be expected. The other half is lowland with rolling hills and elevations from 100 to 300m. Five major rivers flow within the park and stunning waterfalls are the trademark of Dong Hua Sao. Bolaven is believed to be an extinct giant volcano but it is hard to distinguish after millions of years. The fertile volcanic soil is considered to be the best in Laos and combined with the cooler climate, an ideal ground for growing coffee, tea and vegetables. Luang Say Residence is a 5 star luxury boutique hotel set in the UNESCO heritage city of Luang Prabang. Surrounded by lush and tropical gardens with great mountain views, this is an ideal place for anyone looking for a truly relaxing destination. The grand, colonial style mansions that evoke the spirit of mid-19th century exploration include 24 suites: 20 Pioneer Suites spread out across 5 pavilions and 4 Explorator Suites located in the main residence. All rooms are fully equipped with the latest facilities. With its ideal location, guests can reach nearby attractions and join activities such as cruising the Mekong River, elephant riding as well as visits to beautiful local waterfalls. L’Eléphant restaurant is located in the heart of the historic peninsula of Luang Prabang, between the Mekong and the Nam Khan rivers. Luang Prabang is the former Lao royal capital and a UNESCO listed World Heritage site. This wonderful restaurant is set in a 1960’s colonial building with a menu consisting of dishes made with local natural produce grown in their own gardens. Fresh herbs such as coriander, mint, ginger and lemon grass. Coconut milk, Luang Prabang mushrooms as well as fish from the Mekong River. Guests also have a chance to enjoy a cuisine which mixes traditional French and local Laotian dishes. For example: lamb shank perfumed with Indochina cardammon, tarte Tatin with exotic fruits and duck breast roasted with “Mak Toum” via the Burgundy snails. 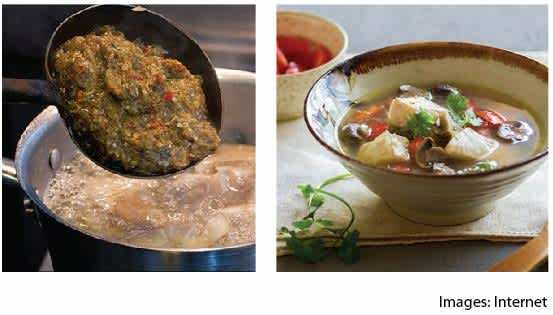 Dtom Jeaw Pla is a rustic and spicy ﬁsh soup which is easily made. 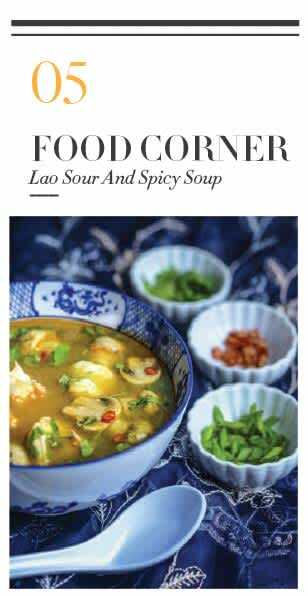 It presents humble countryside charm with fresh essence of ﬁsh and a delicious silky broth with a scent of lemongrass, a distinctive Lao herbs. – 400 g Tilapia ﬁsh ﬁllet, cut into wide stripes. – 5 cups of water. – 2 stalks of lemongrass. – 120 g oyster mushrooms. 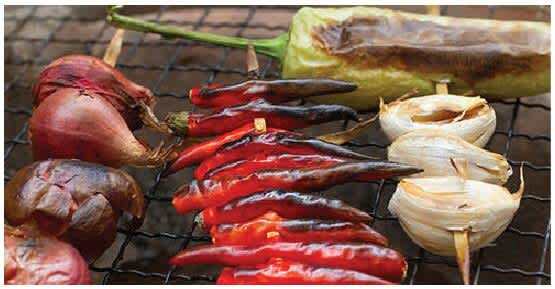 – Grill the eggplants, garlic, banana chilies, red chillies, shallots over a charcoal grill or in the oven. – Peel the grilled eggplants, chillies, shallots and garlic and put in a small bowl. – Add a small teaspoon of salt, crush the mixture of grilled ingredients until they are all ﬁnely minced and become a homogeneous paste. Set aside. – Place the water in a pot and start heating. Pound the lemongrass stalks and add them to the pot. – Add a teaspoon of salt and some ﬁsh sauce. – When the water boils. Add the ﬁsh and avoid stirring. – Add the mushroom and boil until the mushrooms and ﬁsh are done. – Add the paste and lemon juice. Stir well. – Turn off the heat before adding the chopped spring onions and saw cori- ander. Add basil. – Serve with noodles or vermicelli.